opposite direction. The “bump” is actually the prominent head of the metatarsal bone. Patients often don’t realize that they have a bunion. There are a variety of conservative treatments for bunions. wearing supportive shoes with a wide toe box. padding and anti-inflammatory gels and creams to help relieve the pain. If conservative measures do not help the patient or alleviate the pain, surgery is usually recommended. 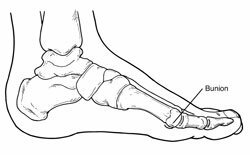 Bunion Surgery Bunion surgery shifts the metatarsal bone back in the correct direction and restores the proper balance of the joint. It is a surgically created fracture that is fixated with a pin or screw. Often the patient can walk immediately after the surgery as long as they wear a special shoe that doesn’t bend. Bunion surgery is outpatient surgery and the patient can go home a short time after the procedure. Recovery time from bunion surgery is variable and depends on a patient’s occupation and overall health. Your podiatrist can give you more information about the surgery that you would need after examining you and taking x-rays of your feet.